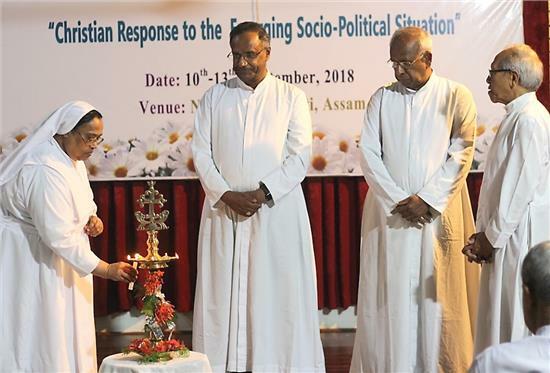 Guwahati, 10 September: The North East India annual Regional Pastoral Conference got underway at North East Diocesan Social Forum, Guwahati on 10 September. The 2018 edition of the three-day annual conference was inaugurated by Archbishop Dominic Jala of Shillong, and the President of the North East Regional Bishop’s Council gave a presidential address inviting the 150 delegates from across North East India and resource persons and observers from around the country to have a honest discussion on the theme “Christian response to the emerging socio-political situation” in India in particular and the North East in general. “We are going through a challenging time that needs a good Christian response”, he said. The highlight of the annual conference this year is that it is the first time delegates from other church denominations have become part of this regional gathering. Most Rev. Thomas Pullopillil of Bongaigaon Diocese and the regional chairman of the commission for Ecumenism and Dialogue presented the theme and gave a brief introduction on the Christian presence in India and in the North East. Rev. Fr. G. P. Amalraj, the Deputy Secretary to the Regional Bishops’ welcomed all the delegates and Most Rev. Thomas Menamparampil SDB, Archbishop Emeritus of Guwahati released his new book ‘Stored Anger’ at the backdrop of the event. Children from Women Development Centre, Guwahati, presented a prayer dance at the inauguration of a three-day event, which will conclude on 13th September with eminent speakers giving national, regional perspective to the theme.